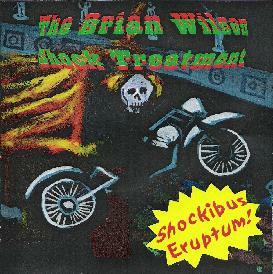 The Brian Wilson Shock Treatment - "Shockibus Eruptum"
The Brian Wilson Shock Treatment follow up last years We Are The BWST CD (see AI #26) with another fun trip down 60's era memory lane with 12 new raw and completely fun garage rockin' psychedelic songs. And if you haven't heard the band before, the nod to Blue Cheer in the album title might give you a clue. In fact, the set includes a song titled "Blue Cheer" which is about as garage-psych-punk-metal nasty as you can possibly get. Well... "Chant Of The Golden Dawn" comes mighty close. A total acid mindfucked freakout tune. Yummy stuff! Other highlights include "Penelope-Anne", a cool mixture of down ‘n dirty garage rock and bubblegum psychedelia. "Neptune's Sands" features hard driving psychedelic rock ‘n roll with bashing guitars and catchy melodies. "Trippin' Too Hard" is one of my favorites, being an aptly titled ripping psychedelic tune. "Corpsica" is similar but the addition of cool 60's styled organ. "Orange Skies" is a total floating flower power psychedelic song. And "Born On A Saturday" has a mucho tasty Jefferson Airplane/Doors sound. If you lived the psychedelic 60's and feel the world has never been the same since, or missed the 60's and want a little taste, The Brian Wilson Shock Treatment are just the tonic you need. Sure, it's a retro sound, but it's an oh so luscious sound that they've got down pat. And they can really write songs!